If you have a hopper or tank in your facility, one great way to accurately keep track of its contents is to weigh it. The ITCM Series modules utilize several Rice Lake Weighing Systems components (mounting hardware, load cells, junction box) to provide an unmatched level of performance in suspended tank and hopper weighing applications and mechanical scale conversions. The ITCM HE incorporates clevis and unique rod-end ball joint assemblies to reduce the overall length to less than half of the traditional tension cell mounts, while providing correct load alignment. 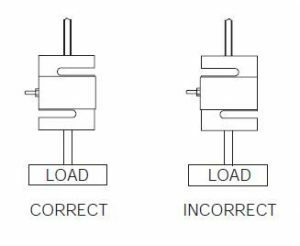 In addition, the load cell is completely electrically isolated from stray currents, which are a major cause of load cell failure. To complete the design, a grounding strap connects the two clevis assemblies to further provide safety to your load cells. As always, the installation should be planned by a qualified structural engineer. Each installation is unique, and this manual is meant to serve only as a general guideline for installation. The ITCM Weigh Module provides excellent performance in suspended tank and hopper weighing applications. The ITCM reduces the overall assembly length to less than half of traditional tension cell hardware arrangements and offers correct alignment of the assembly. The combination of clevises and rod end ball joints isolates the load cell from extraneous forces detrimental to accurate system performance. The ITCM incorporates an insulating system which resists the flow of stray currents through the load cell. To insulate the load cells from the clevises, the clevises incorporate nylon insulating washers, and the rod end ball joints are lined with Teflon®. A parallel grounding strap connects the two clevis assemblies to provide an alternate path to ground, preventing load cell damage from electrical spikes or stray currents. The ITCM modules feature RL20000 series S-beam load cells and are available in a variety of capacities, ranging from 100 to 20,000 pounds per module. A single ITCM module is often used to convert a mechanical scale to electronic operation, allowing for the added benefits of an electronic signal for process control or data collection. When an ITCM module is inserted into the steelyard rod, the mechanical beam or dial is still functional and can serve as a backup indicator. Depending on the weighing application, ITCM modules may be used in single or multiple load cell configurations. 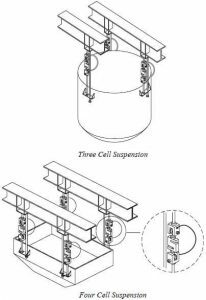 Single cell suspension configurations are relatively simple and work well in low capacity applications which have minimal disturbance from mixers, materials flow, or other agitators. For best results, the vessel should be symmetrical with respect to the suspension point and used to weigh only self-leveling materials, such as liquids. This allows the center of gravity to rise along the same vertical line each time and minimizes the tendency of the vessel to bind against the bumpers. The bumpers only serve to limit sway caused by accidental contact or other external forces. Erroneous scale readings result if the vessel contacts the bumper. Instead of bumpers, horizontal stay rods may be used to rigidly hold a vessel which has a tendency to sway sideways. Also, note that single cell systems must be restrained from rotating to prevent the suspension hardware from coming unscrewed. 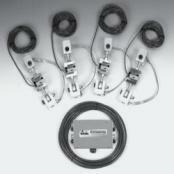 Multiple cell suspension configurations commonly involve three or four load cells. One advantage to using three suspension points is that even weight distribution is inherent in this configuration. Support points should be equally rigid and deflect by the same amount when loaded. Otherwise, one or more of the cells may be overloaded. For maximum stability, attach suspension rods at or above the filled vessel’s center of gravity. In situations where there is a potential for vibration, agitation, wind, or seismic activity, install bumpers or horizontal check rods to check the sideways motion of the vessel. We always like to mention that all suspended vessel weighing systems must be protected by safety check rods, chains, or other means to prevent damage or injury in the event of a failure. If piping or conduit is required, make sure that it runs horizontally and verify that the distance from the vessel to the first pipe support is 20 to 30 times the pipe diameter. If necessary, incorporate flexible sections into the pipe. Suspension rods should be as long as possible to minimize the introduction of side forces. Use only hermetically sealed load cells in washdown applications. Environmentally protected load cells are not suitable for such applications and will eventually be damaged. 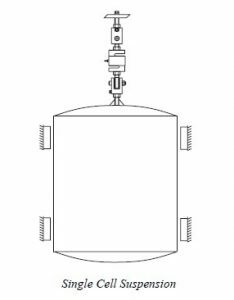 If tanks and surrounding equipment are frequently steam cleaned, or if the load cell might be subjected to direct washdown pressure, a protective shroud for the weighing assembly is recommended. It is important that the S-beam load cells are properly oriented with respect to the load. The cable must emerge from the dead, or fixed, end of the cell. If it emerges from the live end, it will restrain the movement of the cell. This orientation must be followed with low capacity S beams. 1. Select a suspension rod of the appropriate diameter. Use a safety factor of at least 4, based on the yield strength of the rod material. If vibration or shock loads are common, then a higher factor of safety should be considered. Commercially available threaded rod is made from a low yield strength material and will not provide an adequate safety factor in many applications. When determining the rod length, subtract the length of the ITCM module from the overall suspension length, making allowance for complete thread engagement in each clevis. 2. Making certain to provide adequate thread for the jam nut, cut the suspension rod near its center point and thread the ends that screw into the ITCM module. 3. Making sure to put the jam nut on first, assemble a clevis to the top and bottom rods. Screw the rod in sufficiently so that all threads of the clevis are engaged. Lock each clevis in place using the jam nuts. The clevises should be rotated 90° relative to each other. 4. Initially, the lined rod end ball joints are stiffer than regular rod end ball joints. This is normal. Verify that all threads of the load cell are engaged by the rod end ball joint, then lock in place with the jam nuts provided. Screw the rod end ball joints into the load cell. Align one so the flat face is in the same plane as the load cell. Turn the other to 90°. 5. Insert the rod end ball joint into the upper clevis. Place a nylon washer on each side of the rod end and insert the shoulder screw. Secure the shoulder screw with the lock nut provided. Repeat the procedure on the lower clevis. Note: The 15K and 20K ITCM models use plain pins secured with washers and cotter pins, rather than threaded shoulder screws and lock nuts. 6. Remove the 1/4” machine screw and lock washer from each clevis. Fasten the bonding strap in place as shown in the illustration below. Make sure to connect the vessel or the support structure to a single system-wide ground. 7. The attachment points on the structure and vessel should be rigid to minimize deflection. Add gusset plates if necessary. Spherical washers help to minimize bending of the suspension rod due to structure or vessel deflection under load. They can also compensate for initial misalignment. 8. In multiple cell applications, adjust the length of each assembly to level the vessel. If the system consists of more than three cells, you must be sure the load is evenly distributed. This may be done by lifting or prying on the vessel at each support point, checking for even load, or by reading the dead load output from each cell. The variation in load among the cells should be no more than 20%. 1. Route the load cell cables so they will not be damaged or cut. Cables should not be routed near heat sources greater than 150 °F. Do not shorten any load cell cable. The load cell is temperature compensated with the supplied length of cable. Cutting the cable will affect temperature compensation. Coil excess cable and protect it so it will not be mechanically damaged or be sitting in water. 2. Provide a drip loop in all cables so that water or other liquids will not run directly down the cables onto either the load cells or the junction box. Attach load cell cable to the dead structure, not the vessel. 3. If conduit protection is necessary against mechanical or rodent damage to the load cell cables, use flexible conduit and conduit adapters at the load cells. 4. Connect cables for the load cells to the summing board in the junction box according to the load cell calibration certificate provided with the load cell and the labels on the terminal strips of the junction box. 5. For better performance, use positive and negative remote sense lines if the wiring run from the junction box to the indicator is longer than 25 feet. • Refer to junction box manual for trimming details. • Refer to indicator manual for system calibration details. If the system powers up and gives some type of stable digital readout that varies with the load on the system, the system problems are probably caused by factors other than the load cells. Often, load cells are blamed for a malfunctioning system and the majority of the time, the problem lies elsewhere. Look for mechanical causes first. If the system can be calibrated but doesn’t return to zero, loses calibration, or demonstrates non-linearity or non-repeatability, see the following chart for possible causes and refer to the following list of checks. 1. Check load cell mount for debris restricting load cell movement or debris between scale and structure. 2. Check that tank/vessel and mounts are plumb, level, and square at the critical areas. 3. Check piping and conduit for connections that restrict vessel movement. 4. If check rods are used, loosen connections to finger tight only for testing. 5. Check load cell cables for physical or water damage. 6. Check all electrical connections, especially in the junction box. Contact the scale sales and service team at Central Carolina Scale today for hopper scale load cells and weigh bars. Nobody stocks more load cells in North Carolina than we do. We can put together a quote for the ideal system for your weighing needs. And when it comes to digital weight indicators, we can meet just about anyone’s requirements for specifications like analog output or a certain price range. We can also repair or calibrate an existing hopper scale. We feature many of the top scale manufacturer product lines to choose from. Call us at 919-776-7737 or complete the Request a Quote form on our website. 70 ft Truck Scales for Sale – What You Need to Look For When Buying. When it comes to buying a 70 foot long truck scale, there are about a half dozen key ingredients to think about. If you don’t look at these important factors it could lead to increased scale down time, increased costs and overall dissatisfaction with your scale purchase. Don’t let that happen, be sure to look at the following key features. We sell several different brands of truck scales but the list below from Rice Lake sums up the key facts to consider when purchasing a truck scale for weighing your trucks with trailer. IS THE TRUCK SCALE BUILT TO WITHSTAND EXTREME USE? Rice Lake SURVIVOR® series truck scales utilize up to 25 percent more steel than most competitive models and incorporate a longitudinal highway bridge design. The Survivor truck scale is designed to provide you with years of service. It’s important to purchase a scale that is built tough and not full of short cuts. DOES THE TRUCK SCALE PROVIDE ULTRA LOAD CELL PROTECTION? SURVIVOR truck scales are designed with the load cell pocket integrated into the steel structure of the scale. Rice Lake truck scales are some of the most reliable truck scales in the market today. The design of their Survivor truck scale is important and is a big part of why they enjoy one of the lowest load cell failure rates in the industry. DOES THE SCALE OFFER BREATHING ROOM BELOW THE PLATFORM? SURVIVOR steel deck truck scales feature an open-bottom design, providing unrestricted airflow to eliminate rust-causing moisture buildup. Important feature since the scale is going to be providing you weights for many years of service. IS THE SCALE TOUGH, FROM START TO FINISH? High-performance epoxy primer and specialized hard-coat alkyd enamel is applied to all visible steel surfaces for a car-like finish that protects the scale from the elements. Once again, this is important since your truck scale is going to be out in the elements for many years. IS THE SCALE AVAILABLE IN CUSTOM SIZES? SURVIVOR truck scales can be custom-built to fit almost any project specification and application requirement including installations on existing foundations or in unique locations with space limitations. One important thing to consider is the width of your truck scale. Many customers will choose a 10 foot wide scale bridge. This is ok but often for just a little more money, you can order a 11 foot wide scale and give your drivers a little extra room to maneuver across the scale. IS YOUR SUPPLIER ABLE TO OFFER A COMPLETE SOLUTION FOR ANY APPLICATION? Our supplier Rice Lake offers not only the scale, but the complete solution for your weighing application. The digital weight indicator is important since it will normally include the truck storage program. We can also provide you with a ticket printer and remote display so that your drivers can see their truck weight on the scale. When you’re ready to proceed with your 70 ft Truck Scales for Sale, give us a call (919) 776-7737 or fill out the request a quote form on our website. Customers have trusted us to sell and install their new truck scale for over three decades.